It is easy to get into a work slump, whether you spend your days in an office or working from home. But what about a slump induced by feeling overwhelmed? When self-managing your time, it can get overwhelming if you don’t equip yourself with tools and strategies to help aid you in finding the best fit for your daily schedule. One strategy I use is blocking time by task in my calendar. 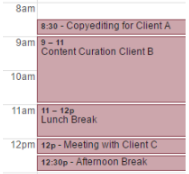 Time blocking requires you to the first break down what needs to be done, then dedicating a specific time of day/day of the week to do it. In that block of time, you will only focus on the task at hand. You can break this down by day, or by the time of day. Time blocking is meant to make you feel more organized, not overwhelmed. See some examples below! You break down your day and allocate specific time blocks to each task. I take this a step further. I break down my recurring tasks into time allotments and assign them to specific days of the week ahead of time. It enables me to focus, and know I have all my bases covered without feeling overwhelmed. It also allows me some extra time each day to work on reactionary work - the stuff that pops up out of nowhere - in a timely way! If you are working with more than one client, breaking this down by the client may be helpful! If you do a myriad of things for each client, and breaking it down for time blocking would be too chaotic, this is probably your best bet! It gives you a schedule to adhere to, and keeps you on track! Look over your past invoices/time logs and get an average time spent on each client, and schedule accordingly. Organizing your time is all about taking the stress away and not adding to it while keeping you in an effective and productive environment! If in 6 months, you realize the time structure you built no longer works, adjust it to meet your current needs. We hope you give these a try, and if you do, let us know how the worked out for you!